President Trump is modestly unpopular, which means he’ll need one key thing to win reelection in 2020: a boost from the economy. New analysis by Alan Abramowitz of the University of Virginia’s Center for Politics suggests Trump’s reelection odds are dicey, if mainstream forecasts for economic growth turn out to be right. The analysis, based on electoral results dating to 1948, forecasts differing electoral vote tallies based on an incumbent president’s approval rating and economic growth in the middle of an election year. Trump’s approval rating is 42% in a composite of polls tracked by FiveThirtyEight. His disapproval rating is 53%, for a net approval rating of – 11%. Those numbers have been consistent throughout Trump’s presidency, so it’s likely his ratings will be similar as the 2020 campaign hits the home stretch. 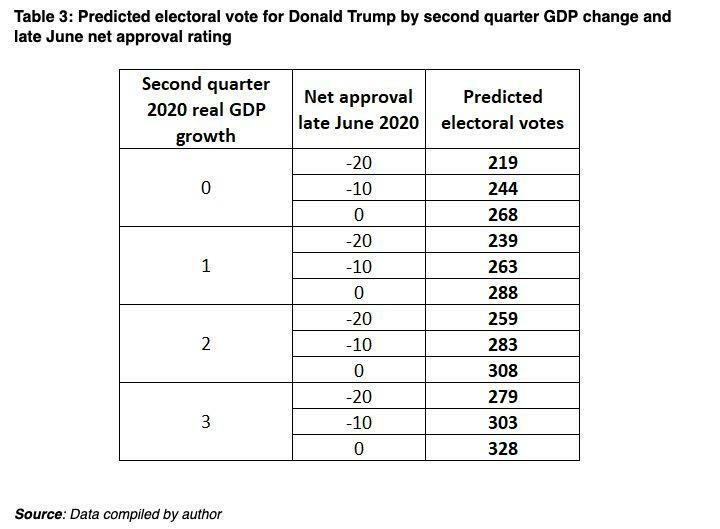 With a net approval of -10%, this model shows Trump will need GDP growth of between 2% and 3% in 2020 to win 270 electoral votes. Will he get it? “It’s going to be close,” says Greg Daco, chief U.S. economist for Oxford Economics. “We forecast growth will fall below 2% by early 2020, but the margin of error could push growth above or below that benchmark.” While growth of 2% would put Trump over the hump with 283 electoral votes, 1% growth would drop the tally to 263. 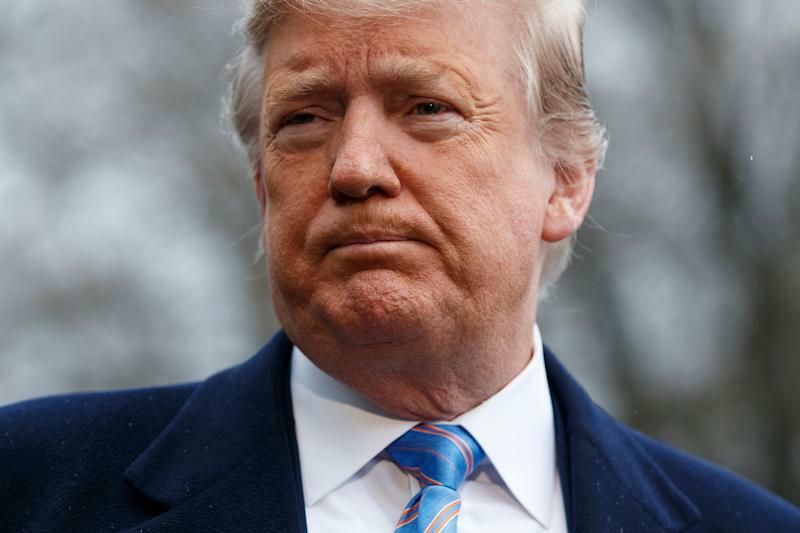 The official White House forecast calls for GDP growth of 3.2% this year and 3.1% in 2020, which would give Trump at least 303 electoral votes, according to the Center for Politics model. But the White House forecasts are more optimistic than almost all others. The Federal Reserve predicts GDP growth of just 1.9% in 2020. Some economists and business leaders worry about a recession by then. Trump has limited power to goose the economy on his own, to help his reelection odds. With Democrats controlling the House of Representatives, he won’t be able to enact fiscal stimulus via legislation—and the bump from tax cuts and spending hikes in 2018 has mostly petered out. Interest rate cuts by the Federal Reserve could boost growth a little, which might explain why Trump has been browbeating the Fed to loosen monetary policy. Trump also wants to appoint Stephen Moore and Herman Cain—both Trump supporters who favor lower rates—to the Fed’s key policymaking committee. Critics claim the two men are unqualified, but they might push for rate cuts that could help Trump’s reelection bid. Trump could also back off his protectionist trade policy at some point in 2020, by, say, removing tariffs on Chinese imports. It’s also possible he’ll become more popular, although Trump’s smash-mouth style of politics seems to have put a ceiling on his approval rating—and it’s hard to imagine him changing his stripes. Much remains unpredictable, and political forecasts could easily be wrong. It obviously matters who Trump’s Democratic opponent turns out to be, and whether the nominee is centrist enough to attract some Trump voters. A terrorism attack or other exigency could alter the presidential approval equation. And maybe Trump will defy odds again, and win even if the economy is working against him. Confidential tip line: rickjnewman@yahoo.com. Encrypted communication available. Click here to get Rick’s stories by email.